As a kid, did you ever have one of those books custom-made for you, personalized with your name and perhaps the names of loved ones in your life? My oldest child has one that’s nicely done; it’s a picture book that he received as a baby gift, with all the animals in the world spelling out his name, letter by letter. But my husband has the real deal, an old-school version from his childhood that sends our whole family into hilarity when we unpack the holiday books each December. It’s a storybook that tells the tale of “Scott” going on a Christmas journey around the world. It includes his brother and sister, his dog, and even a fictitious cat named “Kitty” (the book format couldn’t be adjusted for individual readers, so if you didn’t have a cat, you just had to make one up). The names of each person and pet have very obviously been typed—using a bona fide typewriter—into rather large spaces left blank for personalization, and the pages are filled with typos, generic pictures, and other idiosyncrasies that make this book a treasure for the ages. Though the product may be clumsy, the effect on a child is powerful. If you ever had one of these books, you will certainly remember the feeling you got from seeing your name in print in the pages of a real, hardbound book. These days, in the modern era of self-publishing and custom-made digital photo albums, kids wouldn’t be able to relate. But back then, it was a special feeling—an experience of reading a book tailor-made for you, and for you alone. Have you ever had that experience as a more mature, seasoned reader? Have you come across a book that feels as if it was written just for you? If you’re someone for whom books are more of a passion than a pastime, I dare say you’ve had the rare experience of reading a book that speaks to you, for you, about you. The idea of the Cemetery of Forgotten Books will make any book lover sad, thinking about the thousands of real books—many of them hidden gems—that have been forgotten over time. It’s not unlike the feeling you get when you visit an animal shelter, wishing you could rescue all the poor pups that have been left behind. Following tradition, Daniel accepts his assignment to choose one book, which he will take with him, read, and promise to keep alive. As if in a dream, he is drawn to one particular selection hidden among the crowded shelves: The Shadow of the Wind, written by a seemingly unknown novelist named Julián Carax. Back at home, Daniel “fall[s] right into it,” finishing the novel by the dawn of the next morning. As Zafón’s book The Shadow of the Wind unfolds, I waited with anticipation to find out more about the story within the story, Carax’s—as opposed to Zafón’s—The Shadow of the Wind. What wonder of a novel would arouse such literary passion in Daniel? What kind of plot and characters would draw him in to the point of making him track down the author and save his books at all costs? When it comes to Zafón’s The Shadow of the Wind—not Carax’s—there is much more for readers to chew on, think about, discuss. The novel deals with Spanish history, post–World War II Europe, and political intrigue. It has inspired comparisons to Charles Dickens, Victor Hugo, Umberto Eco. It is a gothic tale, romance novel, metafictional text, coming-of-age story, and epic drama rolled into one. At bottom, though, The Shadow of the Wind celebrates (albeit in a dark, twisted sort of way) the act of reading. Daniel’s singleminded devotion to Carax and his novel will make you reflect on your own history as a reader. What are the books that have spoken to you, told your story, defined who you are and want to be? For me, that book is Kate Chopin’s The Awakening. I’m not saying I’m Edna Pontellier, and I hope I don’t meet my end by drowning. But every time I read Chopin’s novella, I experience a deep connection that can’t quite be put into words. Zafón doesn’t believe that the art of reading is dead, and neither does Daniel. And neither do the millions of worldwide readers that continue to love The Shadow of the Wind. What is your special book, written just for you? 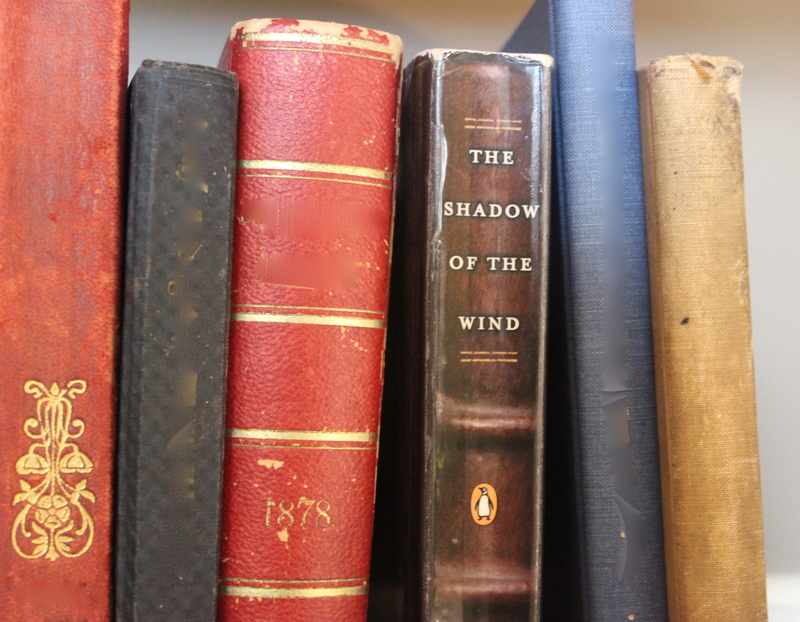 Find book club questions for The Shadow of the Wind here. What’s the problem? We’re all intelligent people and accomplished readers. We’re more than comfortable with each other—we actually have fun together, and we’re not afraid to laugh at ourselves or at literature. So why do we often turn shy when it comes time to discuss a book? According to a recent New York Times online article, some readers are giving up on face-to-face book clubs altogether and going the way of online clubs instead. Among the reasons they gave: discussions were mostly superficial, people talked more about themselves than the books they read, and some members kept quiet for fear of personality clashes. 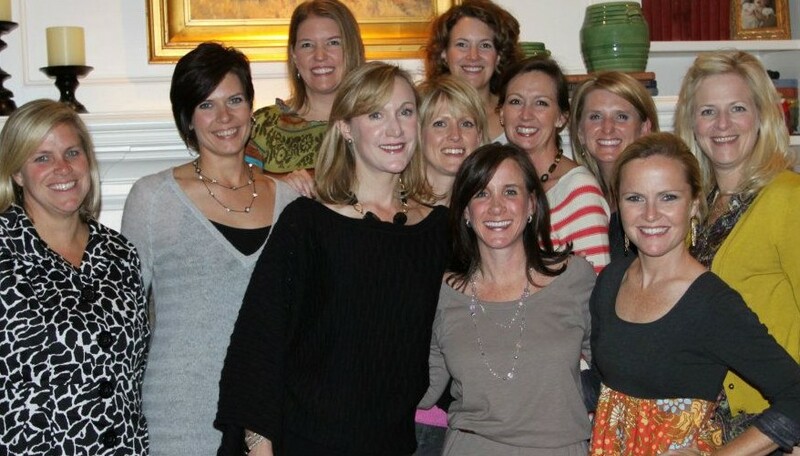 One disgruntled book club member was quoted as saying that, for her, “book club meetings frequently resemble explosive family counseling sessions where every infraction becomes indicative of a deep character flaw.” Yikes. Pass the wine, please. Hearing this makes me want to go give my book buddies a hug and tell them I appreciate them. At meetings of my own book club, we can agree to disagree, admit we don’t know something, and freely ask questions to learn from one another. (I’ll never forget how much we learned during the discussion of Girl with the Dragon Tattoo, which has some racy scenes that can’t be simply glossed over.) Still, we can probably do better at discussions. We’re good, but we can discuss in a more lively, more interesting, more challenging way if we try. Feeling the love with my book club. In thinking on some of our best and worst discussions, the most memorable ones have mostly been on nonfiction selections. Our discussion of The Other Wes Moore, by Wes Moore, took an obvious turn toward a lengthy debate about nature versus nurture. Battle Hymn of the Tiger Mother, by Amy Chua, made most of us defensive and outspoken about our roles as parents and how our Americanized style of parenting compares to Chua’s Chinese methods. Warren St. John’s Outcasts United: A Refugee Team, an American Town, about a soccer team of refugee kids in a suburb of Atlanta, forced us to confront Southern/American prejudice and consider how we would deal with an influx of third-world immigrants making a home right down the road. On the flip side, some of our worst discussions happened as a result of some of the very best books: Love in the Time of Cholera, by Gabriel Garcia Marquez; Gilead, by Marilynne Robinson; Poisonwood Bible, by Barbara Kingsolver. These great works cast a sobering shadow over our lighthearted gathering. We suddenly became a Literature 101 class waiting for—no, dreading—the arrival of a teacher who never came. We let the novels—their rich language, their fully drawn characters, their rich themes—transform our lively circle into a group of serious, silent students. How would you feel if you stepped into the shoes of these characters—lived their lives, had their struggles, underwent their crises? What kind of mood did this book put you in—depressed, optimistic, angry, sad, uplifted? Why? How is the setting the same or different from our own world? What’s the source of the problems and tension in the book, and how much are those problems like our own? Could the characters change their world if they tried? Does your family have any of these same issues? In the book, what’s the nature of relationships between parents and children, husbands and wives, siblings? Does the book have any familiar stories you already know—maybe from the Bible, folk tales, or everyday life? Which character is most like you? Which one scares you? Which one do you pity? Which one would you want to invite to dinner? How is this book a product of its time? Is it one that book clubs will still be reading in a few decades? There isn’t anything groundbreaking about these questions or this approach. This is just a reminder to all of us of the whys and wherefores of book club. Most of us join a book club because we want to read something that makes us think, that opens up a different worldview, that has relevance for our real lives. My book club will be the first to say that it’s ok to start the discussion focusing on the book but to end up talking about economic issues, modern medicine, or world history. When that happens, we know it’s been a good evening—and a great book. For lists of book-specific questions for your book club meetings, see the page Book Club Questions. 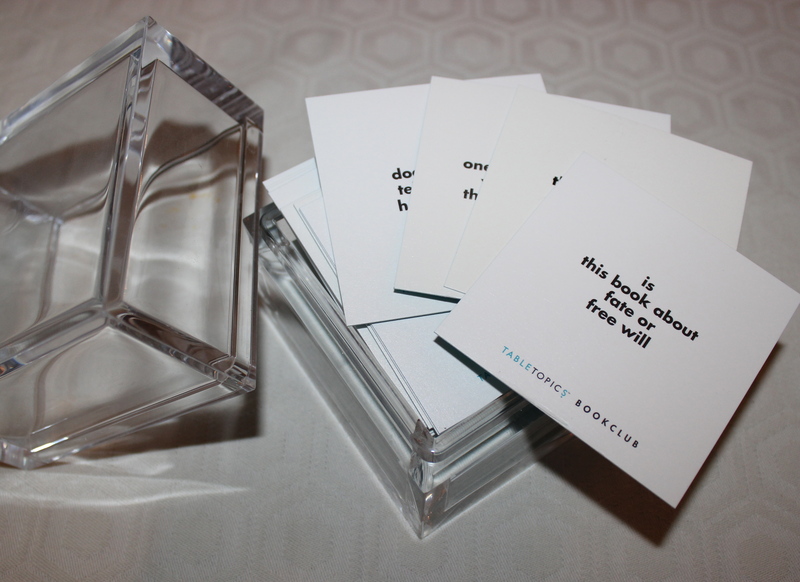 Several books have question lists tailored for them that you can use as conversation starters at your club meeting. My book club wasn’t ready for this one. It was the third death-centered book in a row, following on the heels of The End of Your Life Book Club, Will Schwalbe’s account of his transformative reading relationship with his mother, while she is being treated for and dying of pancreatic cancer, and John Green’s Fault in Our Stars, a story of true love between teenagers who also happen to be dying of cancer. So, when we got to Gilead, with its framework of a dying minister writing a letter to the 6-year-old son he’ll never see grow up, they just wanted to put it right down. And who can blame them? 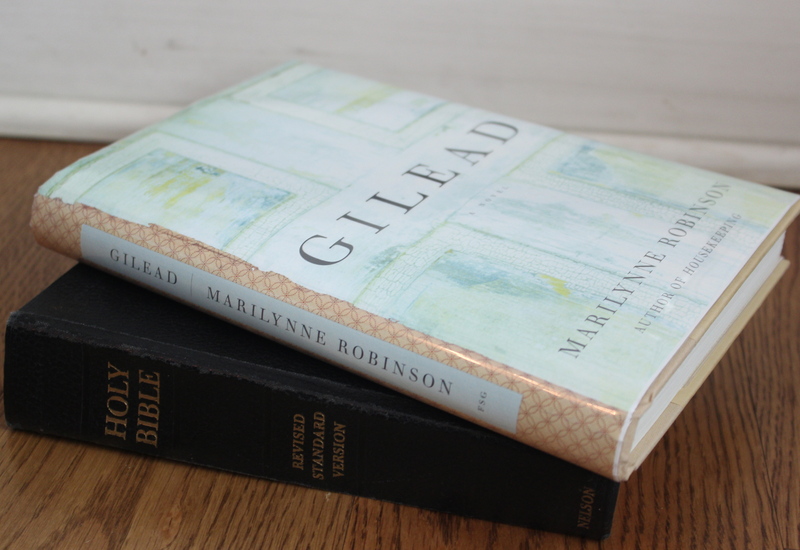 It’s true—Gilead is about a whole host of subjects: forgiveness, the joy of everyday moments, relationships between fathers and sons, religion and theology, and so much more. But, for a group that’s met for two consecutive months to chat about death over Prosecco and pimiento cheese, it’s hard to get past the main character narrating from his deathbed. But, actually, as I reread Marilynne Robinson’s stunningly beautiful novel, I decided I’d be hard-pressed to find a book that’s more about life—with a capital “L”—than this one. In fact, Reverend John Ames’s letter celebrates life so much that he feels a continual sort of ministerial guilt over the potential letdown he might experience in making the transition to the great hereafter. As a man of the cloth, he’s preached for decades on the promise of eternal life, he’s comforted grieving families with the idea that their loved ones have made it to heaven, and he’s counseled Christians on the theology of salvation. Yet, looking back over his 76 years on this earth, he finds this life to be quite wonderful. He finds much to appreciate: the small town that sheltered him for all of his adult life; a deep and abiding friendship with his fellow minister, Boughton; parishioners who cared for him in the darkest periods of his history; the providential turn of events that brought him the young wife and son he never thought he’d have. But his is no sugarcoated view of reality. He’s known hardship and hunger. He’s watched war ravage the country and the black population of small Midwest towns like his leave to look for a more hospitable home. He’s felt the pain of a strained relationship with his father, as well as that of his father with his grandfather’s. He’s experienced the sin of deeply coveting the happiness of other men blessed with the love of a wife and kids. John Ames’s love of life has been well tested, having lost a wife and child as a young man, and getting nothing but pain from the relationship with his godson, John Ames “Jack” Boughton. And, in the course of this long letter, when Jack returns to Gilead, the Reverend’s love—for life, and for a fellow human being—is tested mightily again. But, as he says in his elderly wisdom, “misfortune is not only misfortune,” just as “good fortune is not only good fortune.” Life has its ups and downs, in other words. And perhaps the ups are all the more precious for the challenges of the downs. We value life’s small blessings because, in this life, blessings prove so rare. That seems to be the gist of John Ames’s recurrent memory of his father feeding him, communion-style, as they helped clean up a fire at another local church. It’s a brief moment of fatherly love among the ruins. If there’s a tear to be shed over this book, it will come not from Reverend Ames’s impending death, but rather Jack’s sad departure from Gilead and his family. As he prepares to go, his godfather blesses him, but there seems to be no hope for Jack’s happiness, since he has lost in one fell swoop both the family of his birth and the family he might have had with his wife and child. He will get a second chance in Robinson’s sequel of sorts, Home, so we can be thankful for that. Wiling to see, John Ames envisions his ordinary existence transfigured into something glorious. And, if we are willing to see, we will find something glorious in these pages, too: there’s a lot of life within this lovely novel about dying.